Gadolinium is known to have an association with Nephrogenic Systemic Fibrosis(NSF). The first case of this was described in Yale and published in Lancet. A potential link between NSF and the application of gadolinium-based contrast agents (GBCAs) was first described by Grobner et al in 2006. The risk of gadolinium based contrast agents to trigger NSF seems to be related to the stability of the agent. Thus, nonionic linear gadolinium based contrast agents are more likely to trigger NSF than ionic linear agents both of which are distinctly more likely to trigger the disease than the macrocyclic agents in patients with reduced renal function. Gadobutrol (Gadovist, Gadavist) is a second-generation nonionic, multipurpose, extracellular, macrocyclic gadolinium based contrast agent provided in a 1 molar concentration. As a macrocyclic contrast agent, gadobutrol provides high chelate stability with substantially less—if any—in vivo release of Gd ions as opposed to linear gadolinium (old school agents). The release of gadolinium ions has been linked to an increased risk of NSF in patients with impaired renal function. The highest prevalence of NSF was associated with Omniscan, Optimark as most of these have a weak binding of gadolinium to the chelate. So are these safer? A large study published in 2017 was a prospective, international, multicenter, open-label study in 55 centers. Patients with moderate to severe renal impairment scheduled for any gadobutrol-enhanced MRI were included. All patients received a single intravenous bolus injection of gadobutrol at a dose of 0.1 mmol/kg body weight. The primary target variable was the number of patients who develop NSF within a 2-year follow-up period. A total of 908 patients were enrolled, including 586 with moderate and 284 with severe renal impairment who are at highest risk for developing NSF. Overall, 184 patients (20.3%) underwent further contrast-enhanced MRI with other gadolinium-based contrast agents within the 2-year follow-up. No patient developed symptoms conclusive of NSF. Another study by Lauenstein et al, investigated gadoxetate disodium in 357 patients. No case of NSF was recorded. Another recent study by Amet et al investigated the risk of gadoteric acid in 255 patients on dialysis with no findings of NSF. In addition, Soulez et al reported 2 prospective 2-year studies in 534 patients with either stage 3 chronic kidney disease (CKD) or stage 4 to 5 CKD. No signs or symptoms of NSF were reported after administration of gadobenate dimeglumine or gadoteridol. Smorodinsky et al retrospectively evaluated 1167 patients with chronic liver disease where 72% also had some degree of renal insufficiency. They did not report any case of NSF. Here are images online from medscape education that are very useful on this matter. A lot of centers in the world are now carrying and using Gadovist and perhaps we won’t see any NSF? 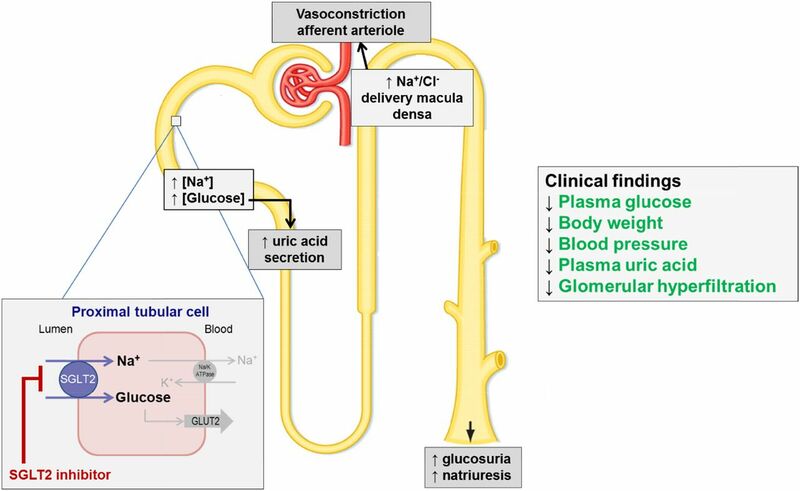 A positive light at the end of the tunnel for nephrology, the Credence trial just got published this week in NEJM, put the glucoretics on top for diabetic nephropathy. When you search “credence” in the oxford dictionary it means” belief in or acceptance of something as true”. 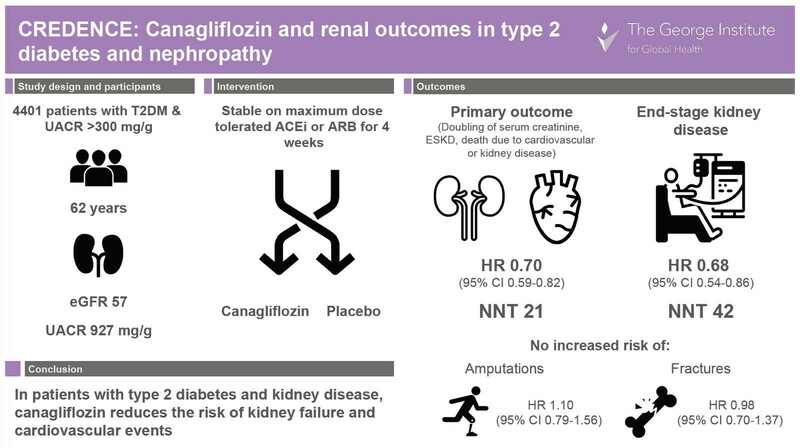 I think the time has come to believe that SGLT-2 inhibitors are here to stay and are going to change the disease of diabetic nephropathy. In summary, this large RCT was stopped early. At that time, 4401 patients had undergone randomization, with a median follow-up of 2.62 years. The primary outcome was a composite of end-stage kidney disease (dialysis, transplantation, or a sustained estimated GFR of <15 ml per minute per 1.73 m2), a doubling of the serum creatinine level, or death from renal or cardiovascular causes. The relative risk of the primary outcome was 30% lower in the canagliflozin group than in the placebo group. The relative risk of the renal-specific composite of end-stage kidney disease, a doubling of the creatinine level, or death from renal causes was lower by 34% and the relative risk of end-stage kidney disease was lower by 32%. The canagliflozin group also had a lower risk of cardiovascular death, myocardial infarction, or stroke and hospitalization for heart failure. There were no significant differences in rates of amputation or fracture. Susan Quaggin‏ @SusanQuaggin" 19 years since RENAAL and IDNT..followed by a series of negative trials...but the drought is over! New therapies for our patients with diabetic kidney disease are a reality - #CREDENCE marks the beginning of a new era in Kidney Medicine "#SockItToKidneyDisease"
Juan Manuel Mejía‏ @Meyaix "Every nephrologist is now talking of #CREDENCE ." Jennie Lin, MD MTR‏ @jenniejlin"#CREDENCE, landmark clinical trial for patients with T2DM and kidney disease, is now published: 30% lower relative risk for primary renal outcome in canagliflozin arm, with pretty darn significant p-value of 0.00001! It was thrilling to watch the results stream live from #ISNWCN!" Steven Coca‏ @scoca1 "You had me at “hello” before the gasp & applause for the tiny p value The separation of the KM curves (effect size) and 95% CI are what had me leaping And more fist pumping when the difference in eGFR slopes were shown"
This is a nephrologist's drug! Finally, we have a positive trial in the making that is going to change the practice of nephrology. Diabetics, non-diabetics, HTN, CHF patients- all might benefit from this discovery! Hereditary transthyretin amyloidosis is caused by pathogenic single-nucleotide variants in the gene encoding transthyretin (TTR) that induce transthyretin misfolding and systemic deposition of amyloid. Progressive amyloid accumulation leads to multiorgan dysfunction and death. Renal involvement is not as common as CNS and or cardiac involvement. 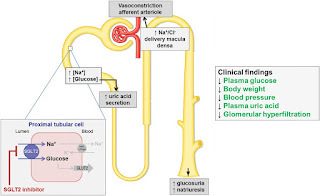 A review in CJASN in 2012 had commented on the renal manifestations of this entity. Renal presentation usually is chronic kidney disease, proteinuria and kidney biopsy showing amyloid deposition. Recently, novel therapies have emerged in the treatment of this entity in the neurology and the cardiology literature. Inotersen, a 2′-O-methoxyethyl–modified antisense oligonucleotide, inhibits hepatic production of transthyretin. This study was published in NEJM last year and it was a randomized, double-blind, placebo-controlled, 15-month, phase 3 trial of inotersen in adults with stage 1 (patient is ambulatory) or stage 2 (patient is ambulatory with assistance) hereditary transthyretin amyloidosis with polyneuropathy. Inotersen improved the course of neurologic disease and quality of life in patients with hereditary transthyretin amyloidosis. What was interesting was that the most frequent serious adverse events in the inotersen group were glomerulonephritis(GN) (in 3 patients [3%]) and thrombocytopenia (in 3 patients [3%]), with one death associated with one of the cases of grade 4 thrombocytopenia. Apparently, it’s a black box warning now with this agent that is given SQ. In reviewing the NEJM paper, they discuss that each of these three patients that developed the GN carried the Val30Met TTR mutation (148G→A) mutation. Two had shown a decline in the eGFR. In all three cases, the kidney biopsy showed complex pathologic features, consistent with crescentic glomerulonephritis superimposed on a background of amyloidosis and (in two cases) interstitial fibrosis. 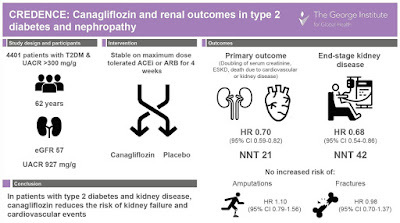 One patient was successfully treated with glucocorticoids and cyclophosphamide and regained clinically significant renal function. Another patient did not receive immunosuppressive therapy owing to delayed diagnosis, and permanent hemodialysis was initiated. A third patient was identified as having clinically significant proteinuria after the implementation of more frequent renal monitoring of every 2 to 3 weeks; this patient did not show a decline in renal function. Urinary protein excretion returned to baseline levels after treatment with glucocorticoids. There is no discussion on the serologies sent or if this was a vasculitic reaction that we see sometimes with anti TNF agents. After the notice of the GN in these patients, they instituted an enhanced monitoring system. After the implementation of enhanced monitoring, no additional cases of severe thrombocytopenia occurred, and a single case of glomerulonephritis was identified early without loss of renal function. There was also a single case of antineutrophil cytoplasmic autoantibody (ANCA)–positive systemic vasculitis reported. It is possible(speculative) that this drug induces an ANCA associated crescentic GN in certain cases. On a pubmed and google search, I found no further published cases of any GNs with this agent. Since the advent of this agent, several other agents are in the market for treatment of Transthyretin Amyloid neuropathy and cardiomyopathy. A similar drug called Patisiran, an RNAi therapeutic for similar indication was published in 2018 as well. The investigators found that this drug significantly improved neuropathy in patients with hereditary transthyretin amyloidosis. This drug had no renal side effects reported in the side effect profile. This is an IV drug compared to the SQ version previously discussed. In another NEJM paper, in patients with transthyretin amyloid cardiomyopathy, tafamidis( oral transthyretin stabilizer) was associated with reductions in all-cause mortality and cardiovascular-related hospitalizations and reduced the decline in functional capacity and quality of life as compared with placebo. The renal side effects were not significant in this drug and in equal frequency as the placebo arm. So as the field of transthyretin amyloidosis is expanding, some of these novel targeted therapies can change the renal effects of this disease. As nephrologists, we need to be watchful for the glomerular side effects of inotersen. Cisplatin is a well known nephrotoxic agent. But here is a scenario. You have a 51 y old man with no history of HTN, baseline serum creatinine of 1.1mg/dl, well nourished now diagnosed with laryngeal cancer. He is planned to get cisplatin. What is the risk of AKI post first dose of cisplatin for this individual? Prediction models are helpful in such instances to guide the oncologists and nephrologists. Similar to the prediction of AKI and need for dialysis post contrast as done by Mehran et al, Motwani et al developed a prediction model for cisplatin based AKI. The predictive model demonstrated reasonably good discrimination and calibration. The multivariate model was developed using a large cohort of patients and internally and externally validated. Its uses age, HTN, albumin and dose of cisplatin as the major coordinates. Identification of high-risk individuals may facilitate appropriate preventative options such as more frequent laboratory monitoring, avoidance of concurrent use of other renal tubular toxins, and careful evaluation of dosing and administration of additional intravenous fluids. This study also suggests that baseline kidney function measured by creatinine may not be a good predictor of the risk of cisplatin induced AKI after the first course. I summarized the scoring the investigators designed and validated. Another example, A 69-year old man with a medical history of type 2 diabetes mellitus, hypertension, has new gastric cancer and is cisplatin-based adjuvant chemotherapy with a dose of 200 mg. His baseline creatinine is 1.0 mg/dL and her serum albumin is 2.8 g/dL. His risk scores for cisplatin AKI after the first course would be as follows: age 61 to 70 years = 1.5; hypertension = 2; dose > 150 mg = 3; albumin < 3.5 g/dL = 2. Therefore, his total risk score would be 8.5 and his predicted probability of developing AKI would be 28-39%. A very helpful tool indeed for all of us to use. What is the connection of cyroglobulins(cyro) with paraproteinemias or myelomas? Cryoglobulins are Igs that reversibly precipitate at temperatures <37°C. The precipitation results in symptoms that are seen in vasculitis: rash, ischemia, ulcers, joint pains, fatigue, and glomerulonephritis. The pathogenesis of cryoglobulin-induced injury involves two main mechanisms, hyperviscosity and immune complex deposition, that activate complement and induce vascular inflammation. Classically, in the renal community, we see this in Hep C association and other infections. In the “Harvoni” era of Hep C treatment, cyro associated MPGN from Hep C is likely on a downtrend. In the largest case series of type 1 cryoglobulinemia associated with MM, six of seven patients were men 28–69 years of age, and all had stage 1 indolent myeloma. Three patients had an IgGκ monoclonal protein, three had an IgGλ monoclonal protein, and one had an IgMλ monoclonal protein. Skin changes and rheumatologic failure were the most common presenting symptoms. Renal manifestations were reported in two patients who presented with nephrotic syndrome and AKI. Pathology usually shows an MPGN pattern of injury on LM and hyaline thrombi within glomerular capillaries. IF may reveal staining for various Igs within hyaline thrombi and the subendothelial space, and monoclonal light chain restriction may be observed in types 1 and 2 cryoglobulinemia. On EM, cryoglobulins may appear as paired, curved microtubules with a diameter of 20–30 nm), although it should be noted that this feature is observed in only a subset of patients. In patients with cryoglobulinemia associated with a lymphoproliferative disorder, treatment should focus on the underlying hematologic malignancy that is producing the cryoglobulin. Fludarabine- and rituximab-based regimens have been used to treat type 1 cryoglobulinemia associated with MGUS, Waldenstrom macroglobulinemia(WM), and NHL. Antimyeloma therapies, including bortezomib, thalidomide, and lenalidomide, have shown efficacy in the treatment of type 1 cryoglobulinemia associated with MM. With WM, besides AL amyloidosis, cyro MPGN is commonly seen as the GN manifestation. High index of suspicion is required to connect the dots and many times the bone marrow and testing might be negative. As we have learnt, the clone might not be that large but it is noxious to the kidney. World Kidney Day is celebrated to acknowledge all who are suffering from kidney disease and to all kidney professionals who take care of patients with kidney disease. Every year, I write about why Nephrology is the best field in medicine during kidney month. It’s my favorite month- as it’s my birthday month, coming of Spring, and showcases our profession of Nephrology. While Nephrology may be facing challenges in recruiting, there is a lot of deep medicine in what we practice in nephrology. As Eric Topol says in his recent book, "most of us are practicing shallow medicine". In other words, we fall for the quick cook book algorithms and screenings and are avoiding the personalized medicine. I think as a field, Nephrology allows for a more deeper form of medicine. Given lack of many randomized trials, we rely on our experience, patho-physiology and clinical acumen a fair amount and this takes us away from cook book medicine. How does one treat a C3 glomerulonephritis? The recent KDIGO2019 update tried to shed some light on that but basically we borrowed our treatment from other glomerular diseases and then we used patho-physiology based strategy of inhibiting the complement cascade since it’s a complement disorder. 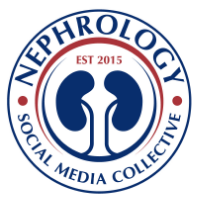 It's not just the science....what is also exciting about Nephrology is that we are the front-runners in adopting social media in it’s education and spreading of knowledge. Other fields in medicine followed but thanks to some great strides made early on, we achieved this as a field. AJKD is probably one of the first few sub-specialty journals to have it’s own blog. Finally, we all love to have fun. Go out there this month and join and create some renal madness. Oh sorry, we cannot say renal- shall we change all renal to kidney ( as most journals want us to) or should be say NephMadness!!. Yes, we also are the pioneers in creating games in medicine. What else can you ask for from your doctor- detail oriented, compassionate, smart( extremely), most well dressed in the hospital, have one of the least burn out rates, make decent money, are social media friendly and make good leaders( med directors in dialysis units). In addition, for the science lovers, nephrologist also are good scientists and willing to publish both positive and negative trials in medicine( a balanced fluid approach). Hmm. and before I close out, we love to create collaborative fields in medicine- Cardionephrology, Onconephrology, Diabetonephrology, ICU Nephrology, OB nephrology.... creating niches and making great strides.